Lodge Cast Iron and Martha White are searching the nation for the best original main dish cornbread recipes in the 23rd Annual Lodge National Cornbread Cook-Off. Now through Jan. 31, 2019, Cook-Off applicants can submit an original main dish/entree recipe that includes at least one cup of Martha White Cornmeal prepared in Lodge Cast Iron cookware. Ten finalists will be selected to compete during the National Cornbread Festival on Saturday, April 27, 2019, in South Pittsburg. FiveStar Professional Cooking Equipment provides competitive cook-off ranges. Recipes must be a finalist’s original creation, may not have won previous awards, may not have been published previously, and must not infringe on upon any other person’s rights. Contestants are required to plate six to eight servings for cook-off judges. Cook-Off competitors cannot be graduates from a culinary institute or be employed as a paid executive chef. Cook-Off competitors cannot be professional cooks/chefs or enrolled in a culinary school. Bloggers are encouraged to submit their recipes. Along with the coveted cast iron skillet crown, the Cook-Off champion will receive $5,000 and a 30-inch stainless steel gas range (a $3,250 value) from FiveStar Professional Cooking Equipment, a division of Brown Stove Works, Inc. The second prize winner will receive $1,500 and the third prize winner will receive $1,000. The remaining seven finalists will walk away with $150, and all finalists will receive a $500 travel reimbursement and a gift basket courtesy of Lodge and Martha White. South Pittsburg hosts the National Cornbread Festival the last full weekend of April. The 2019 event is set for April 27-28. 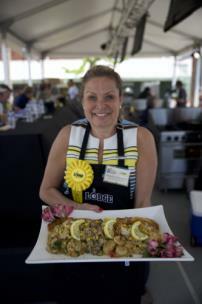 With her recipe, Too 'Gouda' to be True Cornbread Cakes Topped with Pancetta Laced Seafood Cream Sauce, Pamela Gelsomini won the 22nd Annual Lodge National Cornbread Cook-off in April. The Wrentham, Ma. resident won a $5,000 grand prize and a 30-inch stainless steel gas range from FiveStar Professional Cooking Equipment, a division of Brown Stove Works, Inc.
1. In a large bowl, combine the Martha White® Cornbread Mix, egg, milk, corn, and cheese to form a batter. Heat a large Lodge® Cast Iron Skillet over medium heat with the olive oil and 2 tablespoons of the butter. Working in 2 batches of 3, make 6” pancakes (I use an ice cream scoop to get consistent size). Let cook until you can see the bottoms starting to brown, about 1-2 minutes, and flip to brown the other side. Cakes should be fluffy and golden brown. Place on a cookie sheet, covered with foil, and place in a 200° F oven to keep warm.